Whoever planned Daihatsu’s 2019 Tokyo Auto Salon booth proved they have great taste and a sense of humor. 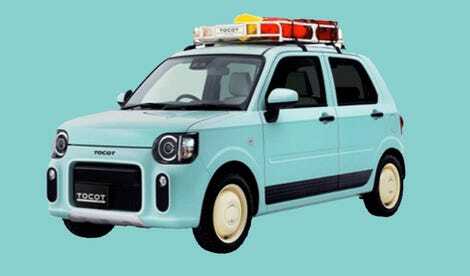 Behold: An entire fleet of delightful Daihatsus dressed up for different jobs. Plus a squirt-sized sports car. I’ve actually been thinking about Daihatsu a lot lately. I dictate all my blogs to my Mac these days, and every time I sneeze, the computer tries to type the Japanese automaker’s name. Nah, that doesn’t really happen. But you can imagine. It’d be funny if it did. Daihatsu’s headline act is the Copen GR. It’s a mildly stiffened version of the company’s compact convertible made in partnership with Toyota Gazoo. The headlights are almost scowling enough to offset the adorably tiny tires and make this thing look mean. Almost. The Copen GR doesn’t get any radical power boost; just a mild tune to make it handle better. and of course, that sweet set of gold BBS wheels. Though with a sub 88-inch wheelbase and a total length of just over 11 feet, I doubt the Copen really needs much help with handling anyway. The more radical version of the Copen on display in Tokyo this year is the coupe. Until now, the Copen has always been a convertible but the slick top actually makes the tiny car look pretty distinguished. 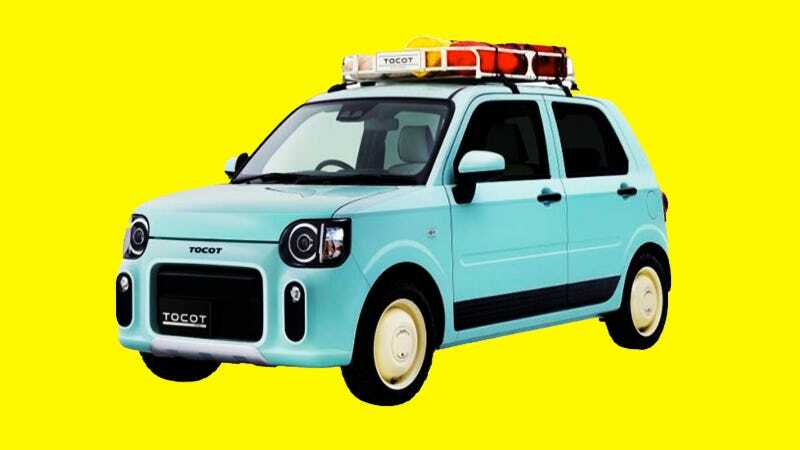 And good news for the people of Japan who dig it; this vehicle is actually slated for production. Though as Carscoops wrote in December, it appears that Daihatsu will only build 200. It’s powered by the same 0.66-liter three cylinder engine that the regular Copen has, but apparently has a “sports muffler” on the option list so look out for this hot rod to be smoking supercars on the Shuto Expressway for sure. I personally really appreciate the squared-off look of the Mira Tocot, particularly the “Active” concept version. Which looks like it’s ready for an African overland adventure. Daihatsu redressed the exact same car to look like a tuner (“Sporza”) and a luxurious thing (“Elegant”). Cute. The vans and trucks are fun, too. I mean, what wouldn’t look good scaled down to Japanese Daihatsu size? Can you believe that thing had a 1.3-liter four-cylinder engine? Yeah, I have a feeling the car looks even smaller in person than it does on camera. We might have to look into Daihatsu’s racing history a little more at some point. In the meantime, I hope you enjoyed visiting Daihatsu’s 2019 Tokyo Auto Salon booth from your computer as much as I did.